It's great to be able to enjoy a trip to the salon, but salons can be very expensive, especially if you have a short style which needs to be cut often. What's more, some people are allergic to products used in salons or just can't find one they like in a convenient location. Cutting your hair at home is a good way to save money and easy to fit into your schedule. Because you can do it often, it can keep you looking your best. Before you try cutting your hair at home, make sure you have a suitable place to do it. A smooth floor, such as linoleum, is best. If all you have is carpet, put plenty of newspaper down. It's useful to have a brush and dustpan for cleaning up afterwards. Hair is easiest to cut neatly when it's wet. If it's inconvenient for you to cut your hair just after washing it, or if it dries too fast, a plant mister can help to moisten it as you go along. You can use any large pair of scissors, such as sewing scissors, to cut your hair, but you will get the best results with specially designed hair cutting scissors. 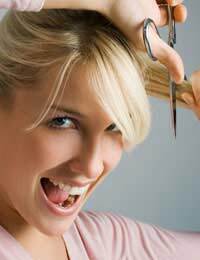 It's important to keep them really sharp as blunt scissors can bruise the ends of the hair and lead to fraying. For shorter hairstyles such as those popular with many boys and young men, invest in a pair of clippers. You can get good clippers for twenty to thirty five pounds and they're very easy to use. Most come with different settings so you can adjust the length of the cut. The first challenge cutting hair at home presents is a simple one - we can't see the backs of our own heads! There are several ways to work around this. The old fashioned method involves sitting in between two mirrors so that you can see the reflection of the back of your head in the mirror in front of you. You'll need to adjust them until you get the angle just right. These days, many people use web cams to help them cut their hair, Simply set up the camera so it can see the back of your head and display the image on your computer screen so you can watch it as you cut. For longer styles, there's a simpler solution. Just lean forwards and comb all your hair down in front of your face. This makes it easy to cut in a straight line all the way across. However you cut, do it a little bit at a time. This will leave you room to make adjustments and even out the length so that you don't find yourself having to take more and more off to compensate for mistakes. When cutting your hair at home, it's best to start out with very basic styles. The easiest approach is to get your hair styled in a salon and then just trim it to keep it neat. Hair can grow unevenly, however, so you'll find you need to make more complex adjustments over time. The more you cut your hair, the easier you'll find it to do more ambitious things. If you have long hair or are trying to grow it out, you may be loathe to cut much off it. If you don't cut it often enough or don't remove enough, you'll find that the ends of the hair become damaged and the damage can work its way back up the hair, meaning that in the end you need to lose more. Try to trim at least half an inch off all your hair every three months. If you have curly hair, you'll find that it's easiest to cut when very wet because the weight of the water straightens it. This will also make your hair look much longer, so don't cut too much off or you may be startled by just how short it looks when it dries. Again, practice will help you to get a sense of the difference between its wet and dry length. Cutting hair at home may seem challenging, but if you follow these basic guidelines you'll find it easy to get the hang of. There are lots of books and videos out there to help you experiment with styles, and there's no reason why home-cut hair shouldn't look amazing.